Croutons are most commonly flavored with parmesan and oregano, but in this heat, I wanted something lighter. These are made with some citrus and fresh dill, resulting in a very distinctive crouton that really brightens an ordinary salad. Preheat oven to 350 degrees F. Toss together all of the ingredients right in the baking dish. Bake for 15-20 minutes, or until browned and dry, stirring occasionally. Cool and throw on top of salad. posted by jessica	at 01:57 PM	Filed under French, Recipes. You can follow any responses to this entry through the RSS 2.0 feed. Both comments and pings are currently closed. Don’t tell the food police I said this, but croutons are the best part of a salad! Citrus party in there! Nice way to brighten up the croutons. And yes, although they are not the healthiest thing for you, they do wonders for a salad! 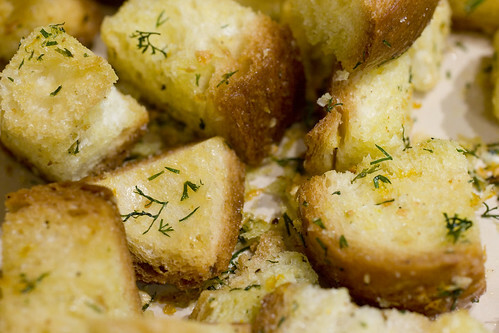 I love all things bread – croutons especially CRUNCHY! I never thought to change up the way I make croutons, but you’ve inspired me. These sound delicious – I bet they would be perfect on arugula with a drizzle of olive oil and some pecorino. Lovely croutons! I also like to make my own croutons. I use sourdough bread with a mix of 1 or 2 or 3 cut up herbs! 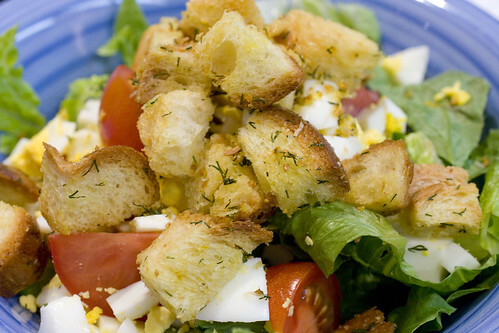 croutons are such a necessary component of a salad. that crunch adds so much. love the citrus zests! What a nice way to make croutons!